Our PatioLockTM pet door inserts offer the Ultimate in Security and Convenience and are unmatched in terms of benefits to you compared to all other temporary pet doors on the market. 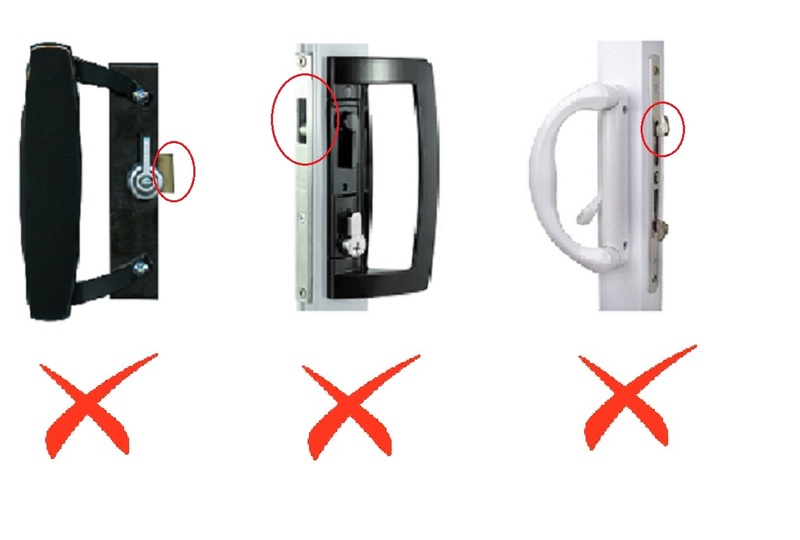 Please go through and check the following steps to ensure you order the correct door and accessories. Any questions, feel free to email sales@modernpetdoors.com.au or call on 0431 908 929. The dog door fits inside the glass door track and up against the wall frame. It's stationary. The glass door opens & closes against it. 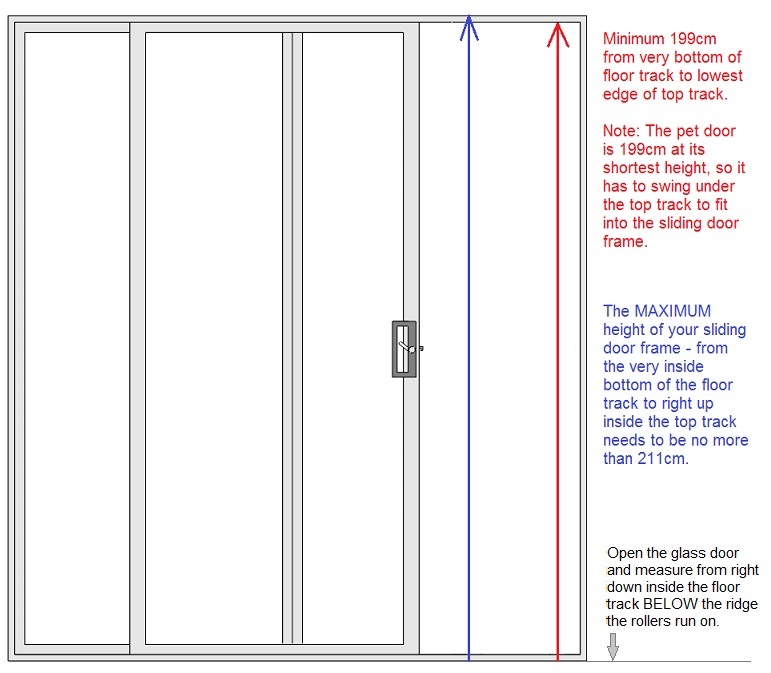 Check your sliding door height falls within the 199-211cm height range outlined below this section. If your door height is above 2.1m (e.g., 2.35m or 2.65m), then you can order an extension kit with the Medium and Large flap size doors by clicking on the shop tab in the menu, then pet door options, then you will see the item for the extension kit for $60/kit. Handy skills are needed to fit the extension kit to the pet door for sliding doors. Once you have selected the model you prefer, you can chose the flap size to suit your pet & Colour of the pet door (Primrose, Black, White, Silver-Grey) when you click on the pet door item. Security (conceals sliding door frame = pry resistant). Use of Fly / Security Screen Door to let air in without all the insects! 1. Adjustable Screen Door Adapter = No cutting, Reusable, Best Weather Seals. Easy Installation/removal, No handy skills! 2. Non-Adjustable Adapter = Cutting, Handy skills, Hack/power saw, Single use, Tricky installation/removal. NOTE the adapter is NOT just for security screen doors, its main purpose is to conceal the sliding glass door (like your wall frame). This prevents prying risk, hides gaps, seals better and forms a seamless join which looks great. The second function is that it also allows the screen door to be used as well as the glass door, so both doors will close into the pet door frame. 3. Do you want to LOCK the glass door with NO Screwing! Want to be able to re-use the system at multiple properties AND get Security (eg., renters). We recommend buying the adjustable screen door adapter with the lockset at checkout to enhance security and function. What if I am not bothered about handy skills and/or Security? If you are handy &/or a homeowner you can buy the Pet Door with either Adapter (no need to buy the locks). However, in order to lock the glass door the lock mechanism needs to be transferred from the wall frame onto the Adapter, which entails screwing, drilling, cutting, and leaving holes in the sliding door and pet door. Alternatively, a patio-bolt (screwing & drilling and tools needed) or a rod in the floor track can be cut and used to wedge the glass door against the pet door. Are some locks not suitable? No handy skills are required but a rubber mallet is needed to fit the Screen Door Adapter Accessory (recommended). 1. 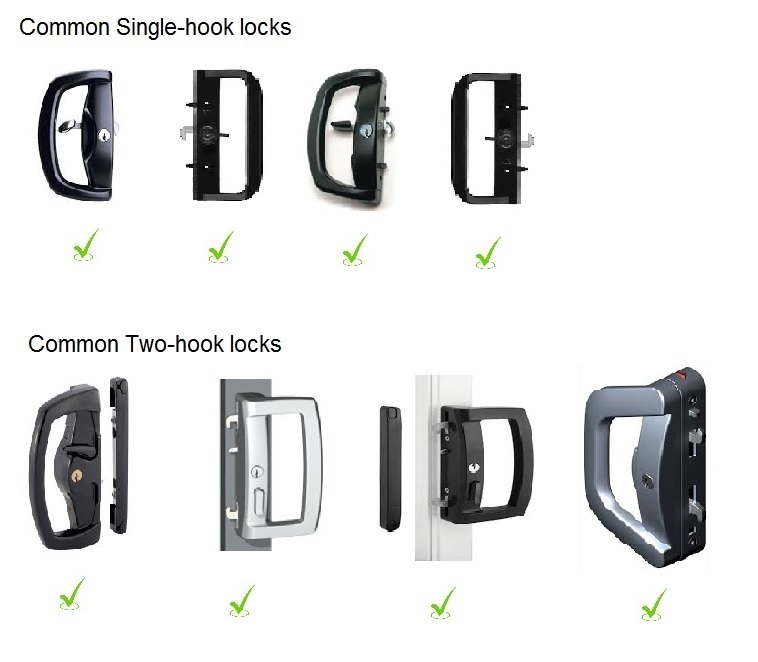 Lock suitability: Check your lock type re one or two ROTATING hooks. 2. Wall frame: Check your wall frame is 10cm or less as per the guideline picture. 3. 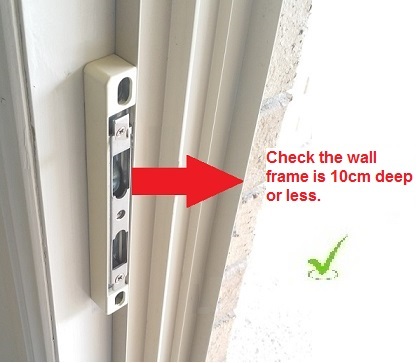 Sliding Door Frame Height: Measure your patio door frame is in the 199-211cm range or add an extension kit for the M & L flap sizes (handy skills needed to fit the extension kit). 4. Flap size: Please check the guide for selecting the right flap size for your pet on the home page. 5. Colour: There are four colours to chose from including Primrose (cream), Black, White or Silver-grey.